Welcome to JustRite Stampers’ newest Wednesday feature, 12 Weeks of Christmas Blog Hops #6! Every Wednesday up until Thanksgiving some of your favorite designers will be joining some of the JustRite design team for a series of Christmas blog hops, showcasing JustRite’s entire Christmas Collection of stamps! This week, it’s most of the Copic design team and Certification instructors! So mark your calendars for Wednesdays at 9am Central for great Christmas gift, card & project ideas, starting at the JustRite Inspiration blog! Today I inked up one of the snowmen from JB-10000 Groovy Snowman. I colored him with Copic markers, added a little shimmer with my clear Spica glitter pen and a little Polar White Flower Soft. I cut him out with a Spellbinder's standard circle die, then matted it atop a Blossom Two die cut. A rhinestone flourish and some stitching finish the card off. "Happy Holidays" is from JB-09255 Christmas Nested Sentiments. I added a little Flower Soft Polar White for snow above his hat and around his body. Dies & Punches: Spellbinders Standard Circle Nestabilities - LG (die 4), Blossom Two Nestabilities (die 4), Papertrey Ink Medium Scallop die. Copic Markers: 0, B0000, B000, B01, C1, C3, C5, C7, V0000, V01, V04, YG13, YG17, YR65. Accessories: Spica Clear glitter pen, Papertrey Ink twill ribbon, Flower Soft Polar White, Rhinestone and rhinestone flourish, Thread and Sewing machine. How beautiful! Love the bling and snow you added . . . and your stitching is perfection! WOW! Simply stunning... I love the rich color combo. Beautiful!!! Great card, what a cute snowman! This is so pretty, love your background of sparkle too! FABULOUS...your card is so pretty, love the colors, love the stitching! Great!!! Such a beautiful card Stephanie! Love the added fluffy dimension & rhinestones! OMGosh! I love this! Perfect coloring, and I love the unexpected purple tones on this holiday card! Hugs to you girl! Oh so beautiful. Love the colors and the nestie you used. Those petals in the plum really set it off. Stephanie, this is soooooo GORGEOUS!!!! I love the coloring, your color choices and the crystal accent. Brava! Awww, that snowman is just adorable! Oh so pretty! I love the purple and the bling! Wow! I never would have thought to use purple for a Christmas card but you've managed to pull it off. 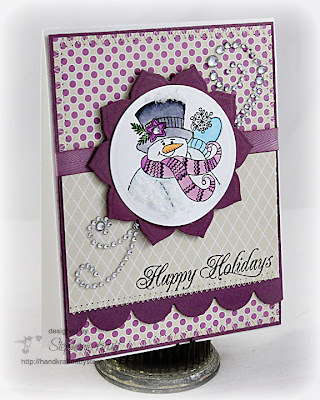 Elegant snowman, love your color choices!!!! Love this! The plums colors are gorgeous and the design is fab!